I have always wanted to own a breadmaker at home since I first started out in the kitchen. However, due to space constraint and fear of it being a white elephant, I was hesitant for a long period of time. But just last week, with much anticipation, I finally made the decision to purchase one and here I am, my first homemade bread product! Upon receiving the breadmaker, I was all excited to start making my own homemade bread. 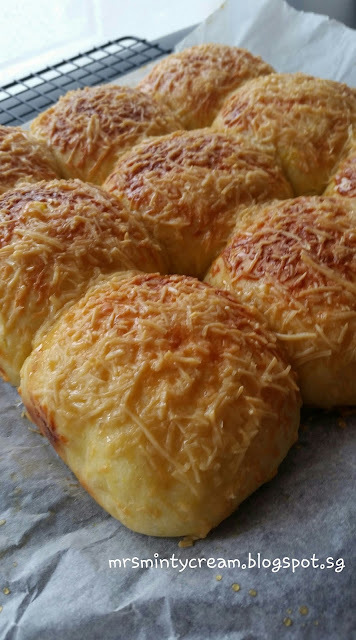 You have no idea how happy I was when the friends with whom I shared the bread with, simply love it! 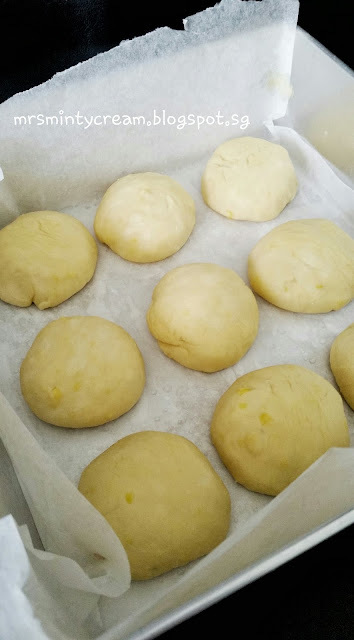 Of course, there are still plenty of room for improvement but I am so looking forward to trying out different bread recipes and making sure my house is filled with the fresh & sweet aroma of homebaked bread! Recipe: Adapted & modified from My Mind Patch. 1. Grease baking pan (I used 9"square pan, for better height of the buns, use a 7" or 8" square pan) by spraying a layer of non-stick spray around the base and side of pan before lining with baking paper. Set aside for later use. 2. 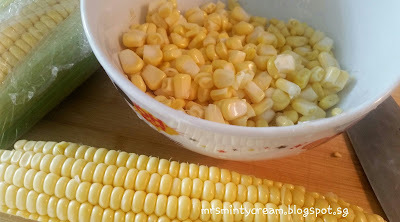 Using fresh corn, collect corn kennels from corn cob and steamed at high heat for 15 minutes. 3. 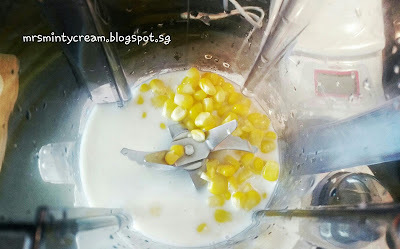 After corn kernels are slightly cooled, blend it (90g) with milk using a food processor or a blender. Make sure the mixture is well blended. 4. Pour corn mixture into a bowl. Add in remaining corn kernels (40g) and condensed milk. 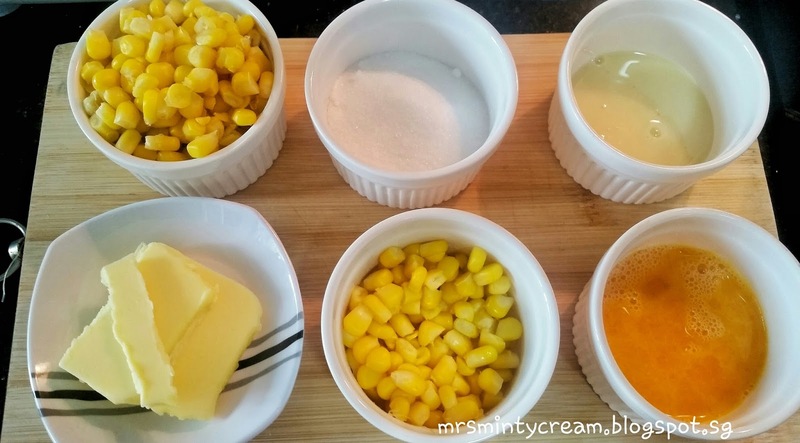 Make sure the combined mixture is well mixed. 5. Pour corn mixture into the bread barrel. 6. 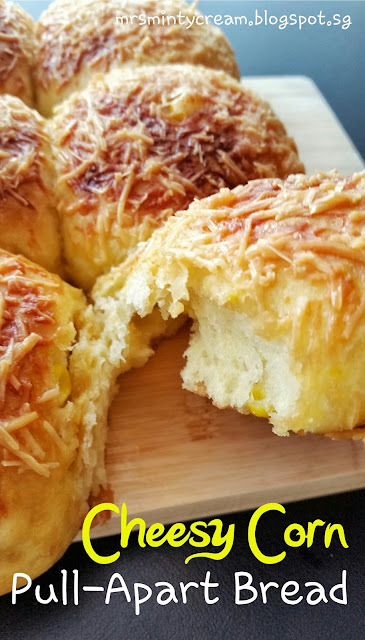 At each corner of the bread barrel, add in sugar, salt, beaten egg and butter. 7. 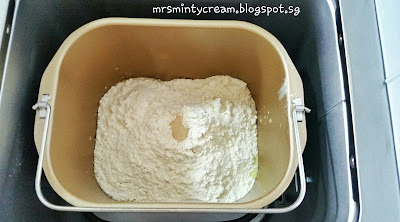 Add in the bread flour and cake flour on top of the wet ingredients. Make sure the wet ingredients are well covered by the flour. 8. 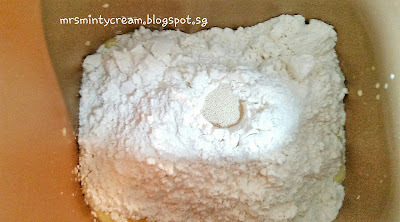 In the centre of the flour heap, dig a hole and add in the instant dry yeast. 9. Secure bread barrel in the bread machine. 10. 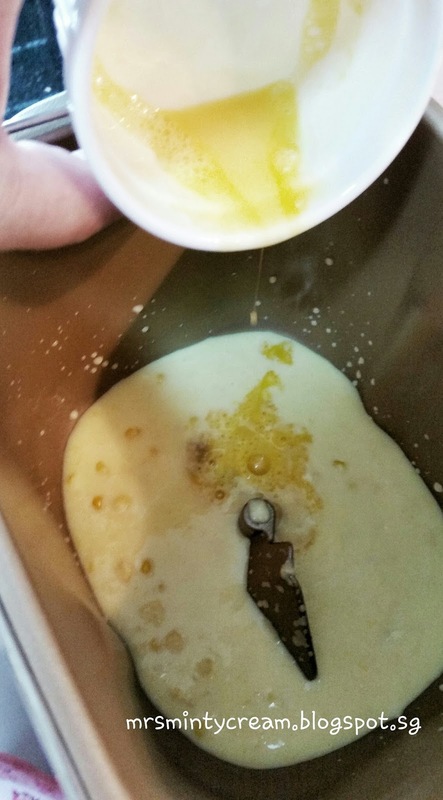 Select "Knead Dough" function on your bread maker, and press "Start" (On my Donlim T15A Breadmaker, I selected function "9" and for 10 minutes - would suggest increasing kneading time to 20 minutes instead to yield a softer & fluffier bread texture). 11. When dough is ready, sprinkle some bread flour over the top of the dough and transfer it from bread barrel to a well-floured work surface. 12. 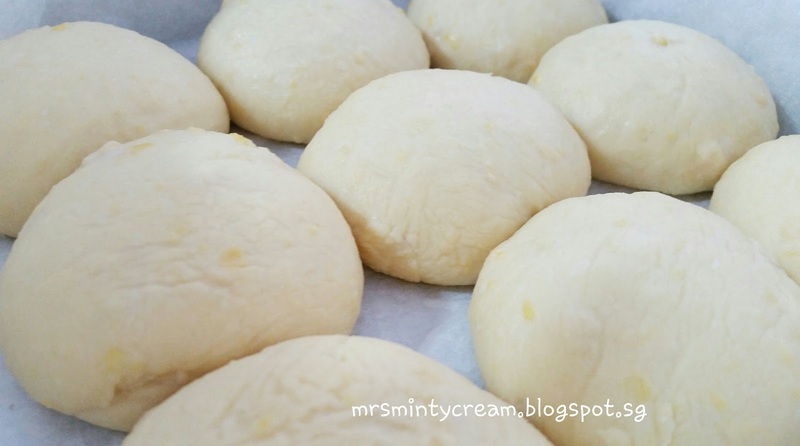 Flatten the dough lightly to release the trapped air within the dough. 13. 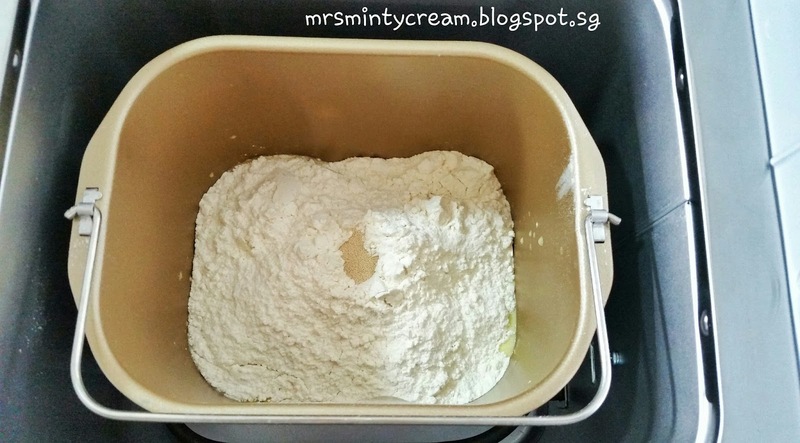 Divide the dough into 9 equal portions, about 63g to 65g each. 14. 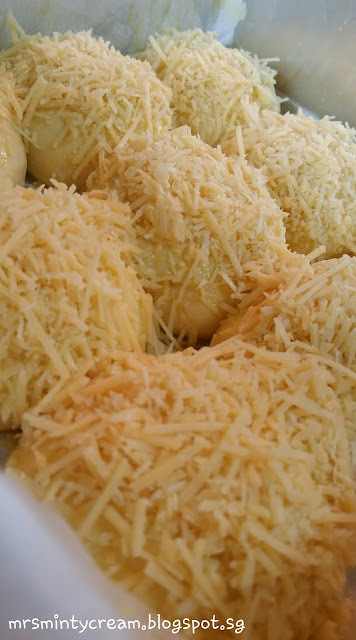 Lightly sprinkle each portion with some flour and roll it within your palms into a round ball. 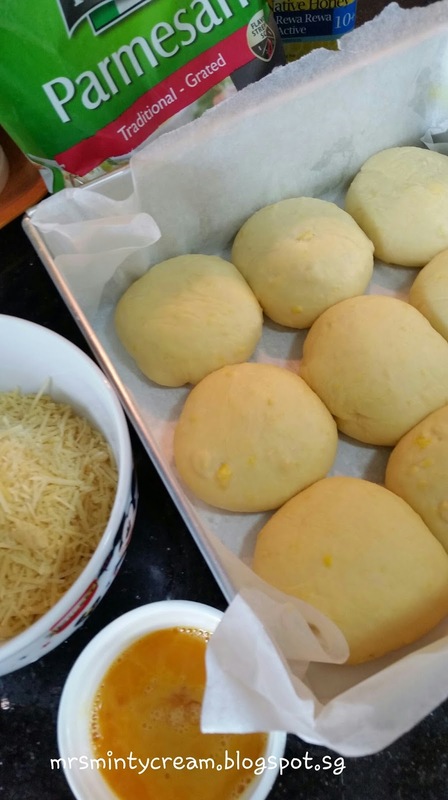 Place the dough buns into prepared baking pan. 15. 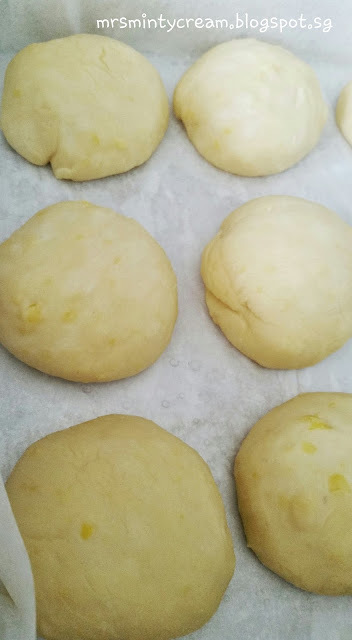 Lightly spray some water over the dough buns before placing baking pan in a closed oven ("OFF" mode) to allow proofing of the dough for 90 minutes or when dough has risen to 1.5 times. 16. 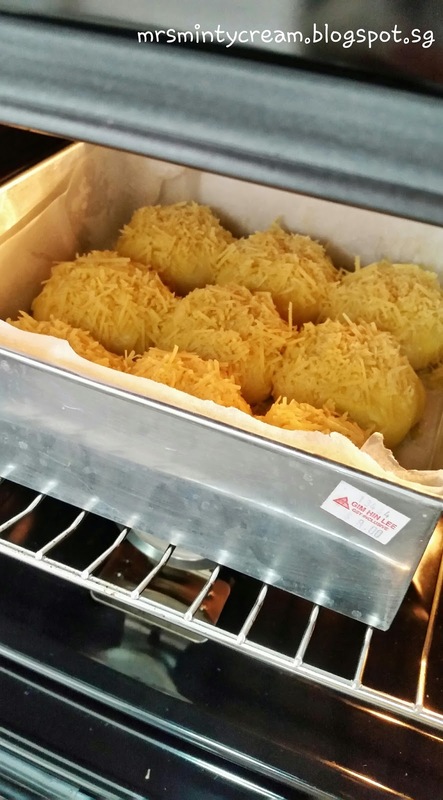 After proofing, remove baking pan from oven. 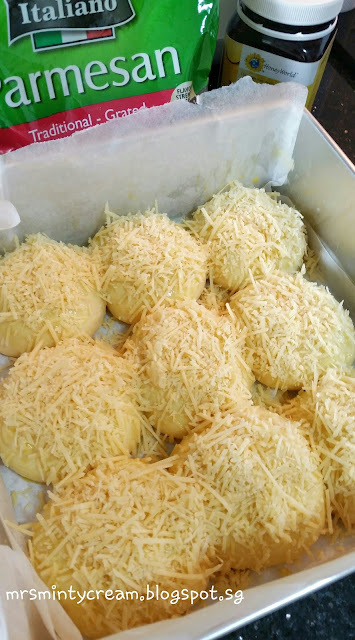 Preheat oven to 170C. 17. On the dough buns, brush a layer of beaten egg before placing the shredded cheese over the top. 18. Bake for 20 - 22 minutes, or until the cheese is partially melted & browned. 19. 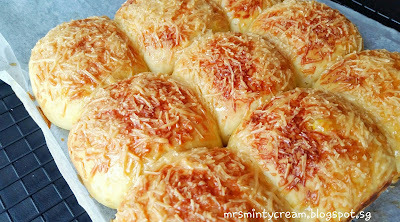 When bread is ready, removed from oven and apply layer of honey glaze on top immediately. 20. Allow bread to cool slightly and serve bread while it is still warm. Wow! What is the brand of your bread maker? I have been eyeing one for years, just like you, I am still apprehensive. Share the review of the machine as well. Thank-you!